Packrafting is the most exciting paddle sport out there. Ok, we might be slightly biased, but more seriously, it definitely is the one water activity that allows so much freedom in terms of all the opportunities it offers and the places you can reach with a packraft. Packrafting is way more than just a water hobby and should be regarded as an ‘outdoors enhancer’, not just a paddle sport. The reason why more and more people get into packrafting is that by owning a packraft, any outdoors afficionado also owns a wide array of possibilities. Packrafts are easy to carry everywhere thanks to their ultralight weight (the Kokopelli Rogue-Lite weighs less than 5 pounds and packs down to the size of a paper towel roll), are easy to set up (it takes less than 5 minutes to inflate and assemble), and very durable (the Kokopelli Rogue comes with a double-seam tape and a kevlar-reinforced floor system). Bikerafting is still a niche activity, and it is hard to understand why. Basically, the idea is to mix packrafting with bikepacking, which is just like going for a multiple-day hike, but with a bike (be it a mountain bike, gravel bike, touring bike...) You probably see where this is going if we add a packraft to the adventure: yes, an infinite amount of possibilities. Pedaling and paddling at its finest, exploring trails, lakes, and rivers… Again, talk about freedom! Most packraft will allow you to carry one bike on their bow, either a regular bike with both wheels removed (and one pedal), or if you want to be really fancy, a few brands now make folding mountain bikes with very light frames. Paddling and pedaling are very similar in many ways, and bringing these two activities together just makes a lot of sense. Mixing hiking with paddling is one of the reasons why I personally got into packrafting. Nothing quite like being able to cover distances by foot and by water. 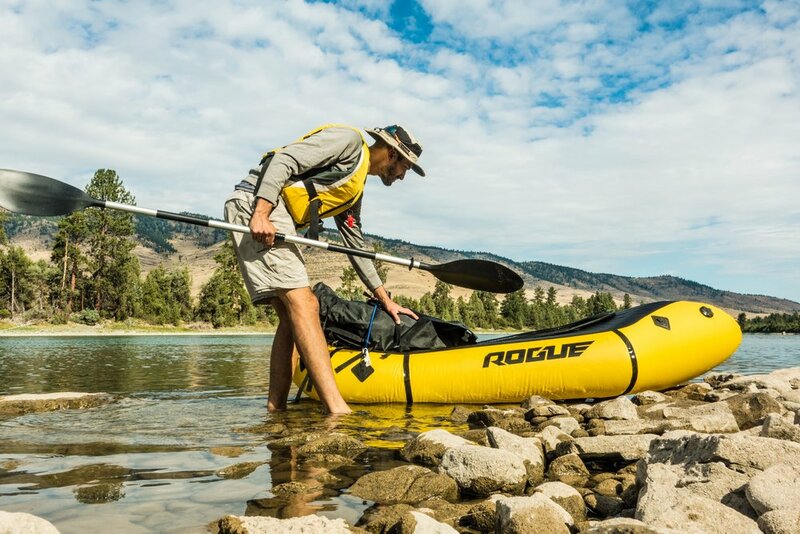 With such a light portaging boat, there are no more excuses to not explore lakes and float down rivers, to reach places you would have missed in the past. In this day and age where hikers want to be the most minimalist as possible, 5 more pounds to your pack may seem like more weight, but it is an addition that may be worth it. Imagine finding camping spots on small islands, and taking shortcuts to access beautiful landscapes. Once more, packrafting plays the role of a real adventure enhancer, and the only way to fall in love with it is to try it for yourself. How could we not include this on this list: one of the most popular boating activities remains fishing (recent numbers indicate that more than 33 million people have fished in the US in the last year, and with a packraft, no single place can resist you. From lakes to rivers, whether on a single or multiple-day trip, alone or with friends, fishing from your packraft will make you feel even more free and self-sufficient. Cutthroats, bass, pikes, walleye… Nothing quite like traveling through the wilderness while foraging for your own food along the way. If there was an activity we might say is the most extreme and ultimate packrafting adventure, it may well be a packrafting-ski trip. Equipped with a packraft, especially in the spring when rivers are starting to flow, and icefields are harder to reach, advanced backcountry skier might want to consider such an expedition. All over the globe, hundreds of people have already mixed skiing with packrafting, and 100% of them seem to agree that they most likely won’t stop there. Equipped with a good set of backcountry skis, a pair of skins, and just add your packraft on top of the list for a complete experience ready to conquer glaciers and rapids. There you have it, the five adventures you might want to pair your packraft with. Which one sounds like something you would try? Let us know in the comments, or share one of your best packrafting adventure memories.